As a committee we collaborate on technologies and processes related to resource recovery implementation, increase PNCWA members’ awareness of and participation in the development of laws and regulations related to recovery of resources from wastewater, and coordinate with other committees and organizations with similar goals. We meet quarterly and hold at least one meeting per year in person. Don't miss this workshop, which focuses on greenhouse gas (GHG) emission and reduction at wastewater treatment plants, prior to the 2017 PNCWA Conference. We'll cover regulation environment, researches, practices and technologies for GHG emission control, both nationwide and within the Pacific Northwest region. Read more. The Resource Recovery Committee is working jointly with the Government Affairs Committee to prepare a Water Reuse White Paper focused on regulatory conditions, challenges, opportunities, and identify actions to support water reuse in the Northwest. Individual state water reuse regulations within PNCWA vary significantly, making water reuse programs in the region challenging when trying to deliver a clear message. The White Paper will summarize general water reuse national policies and current regulations in Washington, Oregon, and Idaho. National and state approaches will be compared and contrasted focusing on areas of consistency. Public communication and support is critical when developing a water reuse program, which will also be a key message of the White Paper. Tremendous opportunities exist to recover a wide range of resources through wastewater treatment. Several facilities in the region are capitalizing on these opportunities. Struvite, which is a crystal consisting of phosphorus, ammonia, and magnesium, can be harvested and utilized as a slow-release fertilizer. 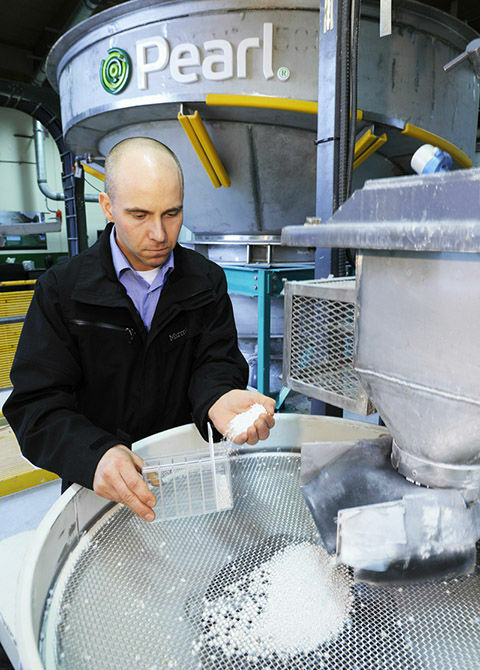 Creating struvite removes a portion of the phosphorus and ammonia loading within a treatment facility resulting in lower liquid-stream treatment requirements (i.e. power and chemicals). An additional benefit is struvite is less likely to form in piping and equipment making operation and maintenance more efficient. Clean Water Services has implemented a struvite recovery program and has been recognized by the Utility of the Future Program for their efforts. Beyond nutrient recovery, many facilities in the Northwest are recovering water for reuse activities. Reuse activities range from primary lagoon treatment with agricultural land application to high level treatment for residential, commercial, and industrial customer use. Additional resource recovery opportunities that several facilities are implementing include biosolids treatment and land application along with biogas recovery used for heat and/or energy production.